With silly sounds, colourful, light-up drums and fun melodies, the Bright Starts Safari Beats will keep your little one happy and entertained for hours. 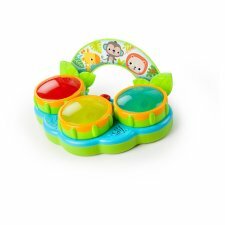 The Bright Starts Safari Beats features 3 circular drums and offers 2 modes of fun - drum mode and melody mode. A character handle makes it easy to take the Bright Starts Safari Beats anywhere. Batteries included.